"Sorta like you remember it from the 70's..."
In a blender combine the avocado, mayonnaise, anchovies, green onion, lemon juice, garlic, and salt and pepper. Process until smooth, then chill for 24 hours before serving. 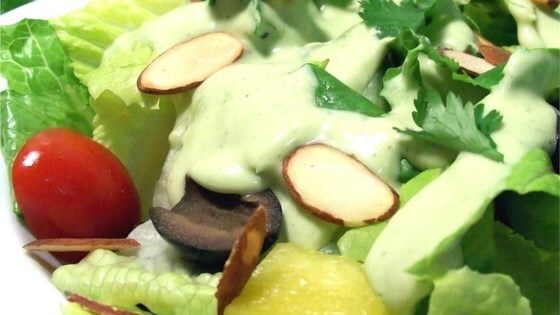 See how to make creamy, herby Green Goddess dressing. A little messy to make but worth it for the great texture and flavor. Was very good. I improvised a bit by using more avocado, more lemon and less mayonaise and it was still great.